Life is seen by religions as a ‘gift’ from God. It is something which only he has a right to take away it is not for humans to decide when your life is up. 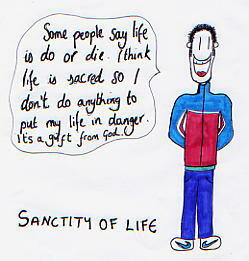 Below is a basic overview of Christian and Hindu understanding of the sanctity of Life. The Sanctity of Life argument can be brought in to your answers when discussing Euthanasia and Abortion issues.